Local Homeless Services, supported by BHCC and Sussex Police, are asking local residents to donate money and essential items to local charities rather than giving directly to people on the streets. It is an unfortunate fact that giving directly to someone on the street often contributes to sustaining their homelessness and therefore increasing their vulnerability. Please promote this message to colleagues, partners, service users, friends and family. Why are homeless charities advising not to give money to people on the street? The best way to ensure that that your money helps people who are rough sleeping is by giving to local charities. Charities have outreach workers who will go out and ensure those who are sleeping rough are given the support they need. Not everyone who asks for money on the street is a rough sleeper. Many people we see on the streets have complex problems but they also have accommodation they can go back to. By giving money to people in these circumstances, who often appear to be rough sleeping, you may be helping to sustain their problems. There is no way to be sure the money given to people on the street is used to buy food, help with health issues or pay for accommodation. Money can be used to fund unhealthy choices which can cause more problems and isolation for the individuals concerned. Rough sleepers are not safe and experience physical assault, sexual assault, being set on fire, having belongings stolen, being bullied and used. When is someone a rough sleeper? How is this different from the street community? The main causes of homelessness are the ending of tenancy, losing a job or relationship breakdown. Outreach teams in the city work with people who they verify as sleeping rough and support them to find accommodation in an area where they are eligible to do so. The verification process means that the teams work with people who are definitively sleeping rough. The reality is that accessing accommodation takes time. This is the same for everyone. When you have accommodation you can wait there before moving to somewhere you prefer. When you don’t have accommodation you have to sleep rough whilst waiting for accommodation to become available. Some people appear to be sleeping rough when they may have access to accommodation. The reason some people may act like they are on the streets is to be able to beg for the things they need, rather than address the problems that are causing them to ask for money. The “street community” is made of people who are not necessarily homeless but, like all of us, want to be part of a circle of friends. The street community spend time together on the streets rather than in each other’s accommodation or in building-based social settings. Outreach workers help people sleeping rough to go to these services if they haven’t already been told where to seek food. No referral is needed. Why not open empty buildings to house people? Brighton & Hove City Council works with BHT First Base, St Mungo’s Street Outreach Service, Riverside St Patrick’s, New Steine Mews Hostel and other partners to provide emergency shelter for people who sleep rough during severe weather. Severe Weather Emergency Protocol (SWEP) provision is normally triggered on the first night when the temperature has been forecast by the Met Office to be at zero degrees or below for the following three consecutive nights. It can also be called into operation when there are severe storm warnings in place at any point in the year. The primary aim of SWEP is to prevent loss of life. Between October 2015 and March 2016 SWEP was used by 118 different people. What are the alternatives to giving directly to people on the street? Encourage people on the streets to access one of the charities, where they can go for food, medical help, financial advice, apply for housing and to access training and work opportunities. If you would like to give money, giving to charity is the best way to know it will be used to directly help people get off the streets. 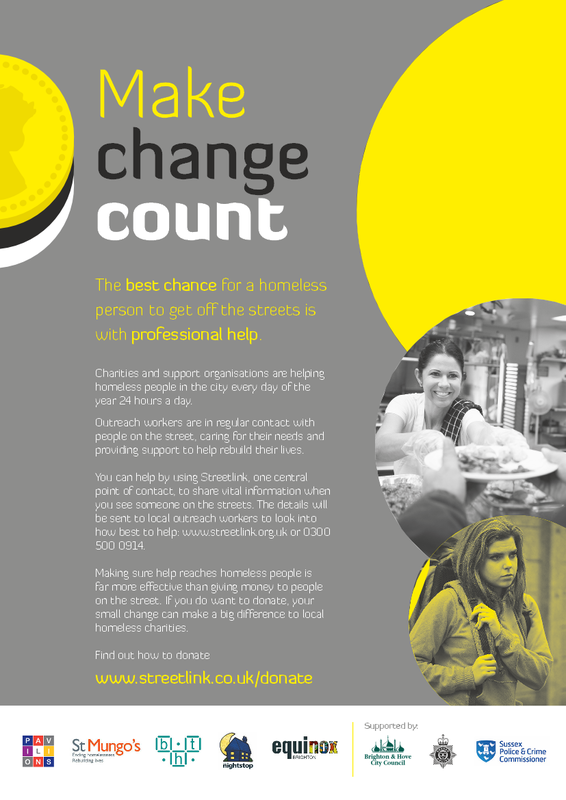 When you give to an individual you may be helping them stay on the streets rather than accessing vital services. Services always need donations of toiletries, towels, underwear and other essentials. Perhaps you could consider organising collections of these items which the charities will share between them to give to the people who use their services. BHT’s services aim to combat homelessness, create opportunities, and promote change. Since the 1960s BHT has developed a comprehensive range of services, working in partnership with other organisations, to meet the needs of homeless, insecurely housed and vulnerable men and women. Our services aim to tackle both the causes and effects of homelessness and poverty. BHT worked with over 7,500 men and women last year, providing practical and preventative services, advice and legal representation, information and guidance in order to improve the quality of people’s lives. BHT First Base provides a no wrong door service in the city where people can self-refer to access support to assist them move on from sleeping rough. First Base, located in the centre of Brighton, operates to assist people who are homeless or vulnerably housed in Brighton and Hove to move on from the streets, address their healthcare needs, start realising their aspirations through work and learning and find a place they can call home. We provide a centre of excellence with our partners in the city ensuring that by working together we can improve health, reduce crime, realise opportunity and provide value for money. In Brighton and Hove we provide the Street Outreach Service. This is a 6 day a week team working directly with rough sleepers on the street to find solutions which will mean that they no longer have to sleep rough. We also run the innovative Housing First service which works intensively with 10 complex clients who have formerly slept rough. Equinox operates as part of the Pavilions integrated Adult Drug & Alcohol Service for Brighton & Hove. The service provides assertive outreach and engagement, working with the street community to address substance use related issues. The Drug and Alcohol Outreach Team aims to reduce street presence, sustain tenancies and reduce harm while helping people work towards recovery. This is done through intensive, assertive support-care navigating people into drug and alcohol treatment, accommodation, meaningful activity and health services. The Drug and Alcohol Outreach Team works with the city’s street drinking population, with locally connected rough sleepers as well as people in hostels and other accommodation. Interventions include assertive outreach to the street and into hostels, facilitating access to treatment, pre and post treatment support and promoting health improvements and recovery. Referrals are generated by the street work of the service or come from other street outreach teams. Sussex Nightstop is a local registered charity that recruits, supports and trains members of the local community that have a spare room to open this up to a young person aged 16-25 who is at risk of being homeless. We have been running this service in Brighton and Hove since 2009 and our volunteers hosts have accommodated in the region of 200 young people, who did not have anywhere else safe that they could stay. Nightstop keeps young people off the streets and away from the many dangers associated with rough sleeping. Sometimes young people stay for a little as a night or 2, our longest stay has been about 3 months. All young people have needs and risk assessments carried out along with background checks to explore suitability for the project.